Emkay Research is well known for its skill in identifying multibagger stocks. 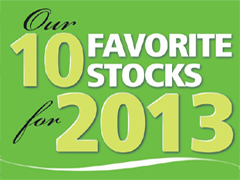 Emkay has recommended 10 Multibagger Large-cap stocks in which they have high conviction of good returns for 2013. Management has guided for 25-28 percent growth in domestic business in FY13 on back of new product launches & Biochem acquisition. The company has launched 30 products in Q1FY13 and 16 in Q2FY13 which will ramp up going forward. Persistent innovation and value addition in oral care segment to aid premiumization and pricing power. We estimate five-seven percent price led growth to sustain in FY13E and FY14E despite tough macro environment. US business, which contributes 50 percent of the formulation revenue is the key driver for the profitability. It is expected to grow by 15 percent CAGR over FY12-14 on back of niche launches like Toprol and Propecia and increase in market share in some key products. HCLTech is on a solid footing ahead with strong revenue visibility with growth led by client mining now V/s new clients earlier. Company remains confident of sustaining rev growth within the top tier league along with maintaining/improving margins. Customers in the economy and executive segment, given their utilitarian nature, prefer tried and tested brands. HMCL has a big advantage as it owns amongst the strongest brand portfolio in the domestic motorcycle market. Concerns over asset quality and margin maintenance had dragged stock performance in past. However, steady state balance sheet expansion with easing NPA pressure will warrant re-rating. NMDC would be ready to address higher demand from the rise in domestic steel capacity with its capacity expansion from 32 mtpa to 48 mtpa by FY15. Focus on evacuation facilities would help NMDC to ramp up volume Q4FY13 onwards. Power Grid is an earnings growth (17 percent during FY12-15E) as well as a re-rating story. Stock is at 20 percent discount to broader market and 10 percent discount to NTPC despite superior earnings growth and certainty. Implementation of digitization will trigger 2.2 times jump in Zee’s domestic subscription revenues over FY12-15E to Rs 2,030 crore. Robust subscription revenue with no incremental capex is likely to drive cash generation.